I started a post late last night after a crap-tastic evening that included my debit card (the number, really. The card is in my wallet) being used all over Queens while I was in Jersey. Then my cell phone was stolen while I was at the grocery store in the Bronx. I came home fired up. Fuming. Insurance claims, police reports, several failed attempts to talk to a human at Sprint customer care… and I started to write. Tomorrow (today) came late–my cell phone is my alarm and that’s gone–because I overslept. I woke up feeling refreshed, though. Coffee in hand, cracked my laptop to finish my “look how poorly the universe treated me yesterday” post. Before I opened my blog I opened Facebook and my page was flooded with my friends’ odes to their mothers and their wives. My anger dissipated. This from a combat tested Marine I admire tremendously. A man whose commitment to God, Corps and Country afforded me the opportunity to get to know his family. The “mother of his children” as per his post, is one of my best friends and easily one of the best moms I know. Instead of remembering to be angry and pounding away on my keyboard about my stolen phone and my violated bank account, I was reminded it’s Mother’s Day. I’m not a mother and may never be; my body said “no” at 9 weeks, 11 weeks, 13 weeks and again at 26 weeks. That’s a post for a different day, if ever. I won’t spend a lot of time waxing poetically about my own mother–she was incarcerated much of my life–and died just before Christmas in 2010. It was the calmest, least stressed Christmas my brother and I remembered at that point in our lives. One day I’ll write the whole story down–it includes heroin, prison tats, foster care, grand theft auto (not the video game) and charging people to spend time with her (you do the math on that one), but not today. Today I’m reminded about the women who stood in the gap she left in her wake of her choices, her illness. And there you have it. 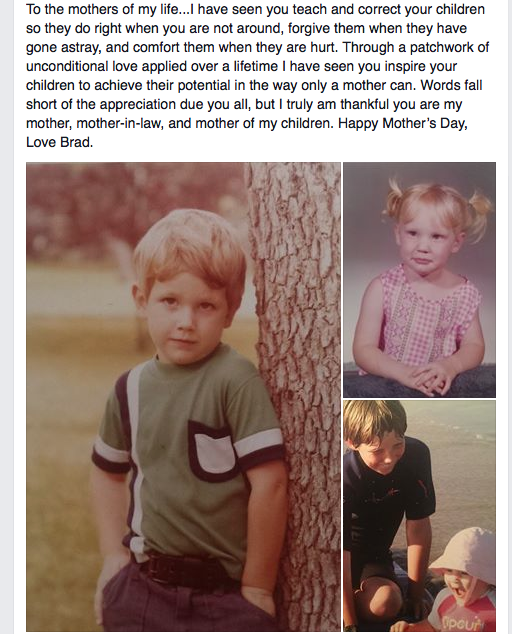 Instead of an angry, self-righteous post about my #firstworldproblems from Saturday night, my friends’ sweet odes to their moms or their children prompted me to pen a few thoughts on Mother’s Day. I’m reminded I have a whole cadre of mamas. Village and all, eh? Good job, ladies. Word to your moms, and thanks for sharing: KatieDanielNate&Emmy, George&Anne, Ian&Kira, Kamey, Billy&Wendy, MegBrandy-BJClaudyJessie&Torie. Moms: I assure you this isn’t an elaborate ruse to explain why I didn’t call you today. No cell+frozen bank accounts= had to use my (written) words to tell you Happy Mother’s Day. You may not be a “mother” but you are an “other” so happy Mothers’ & Others’ Day to you. What an awesome universe providing a horrific Saturday day of events but brought it back around to put a smile on your face and the face of everyone who reads this. Well said Jenn…..and a reminder for us all that no matter the problems of the moment, we benefit from remembering and recognizing those who mean so much to us. It humbles and calms us.